The North Coast Rail Trail Project is a 7.5-mile multi-use bicycle and pedestrian trail proposed to extend along the railroad corridor from Wilder Ranch State Park in the south to Davenport in the north in unincorporated Santa Cruz County. The project also includes improvements to three existing parking areas (Davenport Beach, Bonny Doon Beach, and Panther/Yellowbank Beach) as well as a new crossing of Highway 1 in Davenport. The 5.4-mile section from Wilder Ranch to Panther/Yellowbank Beach is scheduled for construction in 2021. Construction funding is yet to be secured for construction of the remaining 2.1 miles to Davenport, as well as the 3 parking lot improvements and crossing of Highway 1 in Davenport. 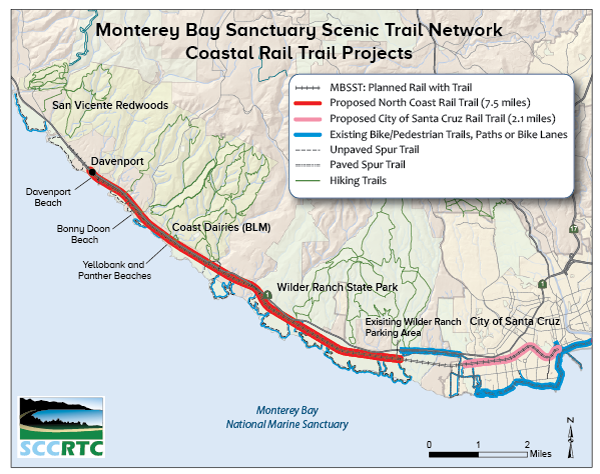 The project comprises the majority of Segment 5 of the larger Monterey Bay Sanctuary Scenic Trail (MBSST) Network, for which a Master Plan was adopted and a programmatic EIR was certified in 2013. The Master Plan was revised in 2014, along with an addendum to the EIR. The RTC is working in cooperation with the Federal Highway Administration Central Federal Lands Highway Division (FHWA-CFLHD). FHWA-CFLHD is the lead agency for design and construction of this segment of the county-wide Coastal Rail Trail project which will form the spine of the broader MBSST Network. The RTC is the owner of the railroad right-of-way and is the agency responsible for overall implementation of the rail trail along the 32-mile rail corridor from Watsonville to Davenport. Funding for design, environmental studies, construction, construction engineering, management, and permitting for this project comes from the Federal Lands Access Program, the California Coastal Conservancy, Measure D and the Land Trust of Santa Cruz County. Partners include California State Parks and the County of Santa Cruz. 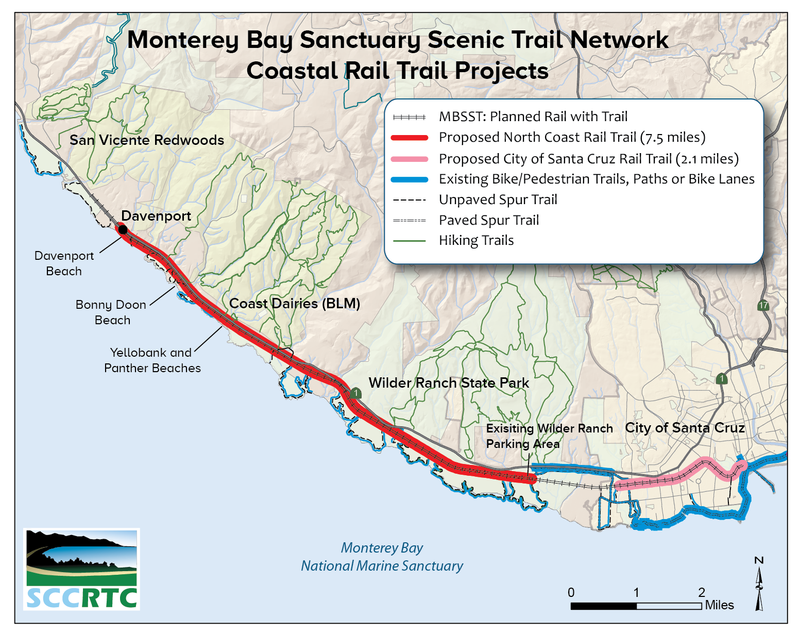 The Santa Cruz County Regional Transportation Commission (RTC) was the Lead Agency for development of the North Coast Rail Trail EIR, which was prepared in accordance with the California Environmental Quality Act (CEQA). The RTC certified the Final EIR on March 7, 2019 with minor changes as addressed at the RTC meeting, and selected the “Proposed Project” as the preferred alternative. The presentation shown at the RTC meeting is available here. A hard copy of the Final EIR is available for review at the RTC office (1523 Pacific Ave, Santa Cruz). Hard copies are also available at the Santa Cruz Public Library Downtown Branch (224 Church Street, Santa Cruz), the Watsonville Public Library (275 Main Street #100, Watsonville), and the Davenport Resource Service Center (150 Church St, Davenport).